County Down Juniors couldn’t have come any closer to globe success at the Super Cup NI. They eventually lost out to near neighbours County Armagh in Friday’s final but it took 18 penalties to decide the outcome. Armagh eventually won 9-8 on spot-kicks, Glenavon goalkeeper Adam McAlpine proving the hero after the match had been drawn 1-1. The County Down team that includes Dromore lad Jake Corbett and Banbridge defender Dylan Stewart pushed them all the way and had led the decider after scoring in the closing seconds on the first half. 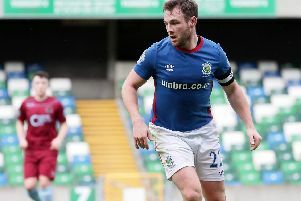 County Down had ousted Rangers from the competition with a 1-0 win in Thursday’s semi-final. Down were in the globe competition after narrowly missing out on the main Super Cup semi-finals on goal difference. That was after they gained seven points from their three group games. Corbett struck to help them to a 3-1 win over Partick Thistle on Monday. On Tuesday, they beat Club NI 2-1 and on Wednesday drew 1-1 with Southampton. The Premier side including Banbridge’s Neil Dillon, meanwhile, made the Super Cup semi-finals after beating County Armagh and MS Select in their group but were beaten 3-1 by Hibernian on Thursday.